Danongan Sibay Kalanduyan grew up in the fishing village of Datu Piang in the Cotabato area of the Mindanao region of the southern Philippines. He was raised in a strongly traditional musical environment, rooted in the culture of Maguindanao tribal traditions. "If you were born in my village you'd hear no Western music, just traditional music," he said. "The music was everywhere and for everyone — not just for entertainment, but also as an accompaniment to rituals and ceremonies. I didn't need a tutor; it just automatically came into my head, day and night. I learned it through exposure, through listening." Kalanduyan began playing Maguindanao music as a child, focusing on the traditions of kulintang (literally meaning "golden sound moving" in English). Kulintang refers to the gong and drum ensemble indigenous to the Sulu and Mindanao islands in the southern Philippines and northern Borneo. The ensemble is named after the principal kettle gong instrument. Kulintang ensemble music is characterized by intricate rhythmic patterns achieved through the combination of a repeating bass rhythm above which a spontaneous, but tightly controlled, improvisation is played. Traditional ensembles varied from three to seven or more players, depending on the area. The main instrument, the kulintang, is a row of from five to eleven brass and bronze gongs graduated in pitch. The number of gongs depends on the ethnic group. 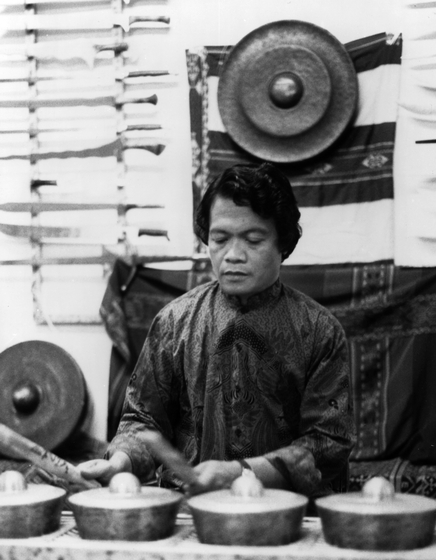 Kalanduyan plays the kulintang with eight tuned, knobbed gongs. The gongs are played with two sticks of soft wood. The kulintang, thought to have been brought from China in the third century of the Christian era, is looked to as the oldest of the performing-arts traditions. Related to the Indonesian gamelan, it is today rooted exclusively in the Muslim cultures of the islands of Mindanao and Maguindanao. Kalanduyan's earliest training, like that of many musicians, involved steadying the large agung gongs when they swayed back and forth as older musicians struck them. At age 7, he started to study other instruments — the dabakan, a goblet-shaped drum; the small babandir, a "timekeeper" gong; and the gangingan, a four-gong set — under his grandmother, father, uncles and cousins. As a young man, he won islandwide competitions on the gangingan and was recognized as a master musician. In 1971, he toured the Far East with the Darangan Cultural Troupe. 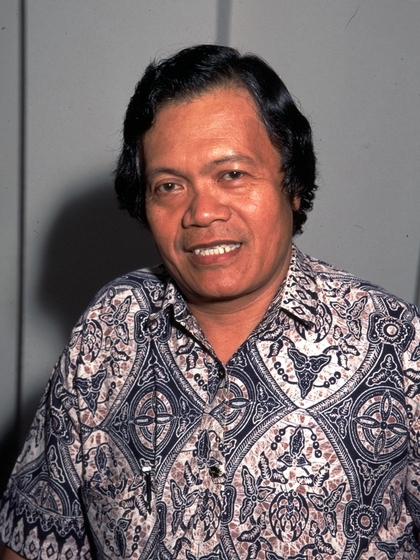 In 1976, a Rockefeller grant brought Kalanduyan to the University of Washington in Seattle as an artist-in-residence in the ethnomusicology program headed by Dr. Robert Garfias. After completing an eight-year residency, he undertook formal study at the university. In 1984 he was awarded a master's degree in ethnomusicology. Later that year he moved to California, where he became the musical director of the Kalilang Kulintang Arts of San Francisco. Word of his presence spread among Filipino communities, and he was soon much in demand as a performer and teacher. He has taught and performed with virtually all the American kulintang ensembles. It is ironic to some that kulintang music, almost entirely confined to a small Muslim minority in the Philippines, has been enthusiastically embraced by scores of young Christian Filipino-Americans for whom, through its pre-Hispanic, pre-Muslim roots, it now serves as a cultural icon of pan-Filipino-American unity. Since 1989, Kalanduyan has worked as director of the Filipino Kulintang Center of San Francisco.. He also serves as an advisor to the World Kulintang Institute and Research Studies Center and is a consultant to several dance troupes. Kalanduyan is committed to the perpetuation of his cultural traditions. He says, "I feel that transmitting the knowledge I possess is important for Filipino-Americans everywhere, not only to preserve what may be the only authentic Filipino musical form, but also to encourage Filipino-Americans to maintain their cultural heritage. To the majority of Filipinos, this music is foreign to them. Three hundred and fifty years of Spanish colonization influenced so much of the Philippines that this ancient music practiced by the tribes in the south is not recognizable to them." "Berkeley-Based UP Group Cops NEA Award." Philippine News (San Francisco) (April 25-May 1, 1990): 11. "Kulintang: Artists for Peace Perform for RP." Philippine News (San Francisco) (December 2-8, 1987): 11. "UPAA Holds Kulintang Workshop." Philippine Bulletin (June 1-15, 1991): 10. Wong, Laura. "Asian Artists Get Ovation in Capital." Asian Week (July 15, 1988): 21. Kalanduyan, Danongan. Mga Kulintang Sa Mindanao at Sulu.